Why Wear a Pregnancy Necklace ? The Angel Caller that is also called “Bola” or “Harmony Ball” is an ancestral jewelry that can be found in many cultures across the world. A gentle shake of this pendant releases a soft chime sound that brings inner calm and harmony, and is believed to call the wearer’s Guardian Angel. In the Mayan tradition, the Angel Caller was worn by the mothers, to protect them during pregnancy, and to calm the newborn baby with this familiar soothing chime sound. ILADO Paris offers the first modern interpretation of this beautiful tradition with a collection of pregnancy necklaces that make the perfect maternity gift! An unborn baby begins to hear at about 26 weeks of pregnancy. It is the perfect time to start wearing an Angel Caller necklace, as the baby will hear the soft chime sound every time mum moves. After birth, the familiar soothing sound will reassure and calm the baby, as a reminder of the warmth and comfort of the womb and the invisible presence of its mother. Beyond its soothing effect for the baby, the Angel Caller pregnancy necklace is a meaningful jewelry piece for mothers-to-be and young mothers. Its soft chime sound symbolizes this powerful, unique and intimate bond shared between mother and baby. It can be worn as a lucky charm, that will accompany them throughout the pregnancy, by calling the protection of their Guardian Angel. The necklace chime sound is also a good reminder to calm the pace and take a few minutes, apart from your daily responsibilities, to think about your little baby and about what is essential. A pregnancy necklace is an ideal gift from a daddy-to-be or during a Baby Shower. Our Angel Caller pendants are unique pieces, handmade by a craftsman in Taxco, Mexico, in the greatest respect for tradition. They are then gilded with fine gold and suspended at the end of precious necklaces. 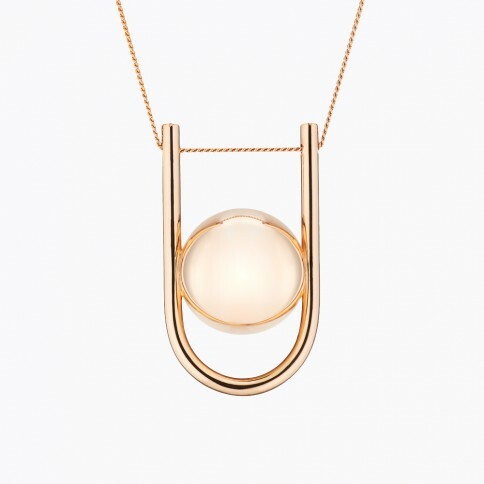 The Angel Caller necklace becomes a beautiful jewelry piece in memory of a unique pregnancy and as a symbol of the infinite and universal bond between mother and baby.